Over the past two and a half years, the Business Link Convergence service delivered by Peninsula Enterprise has helped countless Cornish businesses to fulfil their true potential and develop their operational and commercial performance to maximise their competitive edge. Few companies, of course, escaped the clutches of the recession. But, despite the economic pressures, many locally-based businesses are now in a much stronger trading position than ever before thanks to their determination and the wide-ranging support they’ve received from Business Link. Successes in the manufacturing and engineering sector are particularly pleasing, but this support has also seen many other new generation businesses across the county take advantage of cutting edge technologies and emerging markets. Here, we look at just a few of the Cornish companies that have benefited from Business Link’s Convergence service and become flag-bearers in the county. Falmouth-based Inspired Cycle Engineering is rapidly gaining an enviable reputation among aficionados across the world as the designer and manufacturer of some of the most desirable recumbent trikes and bikes on the planet. Last year its worldwide sales rose by 75%. For over 20 years (18 of them in Cornwall), Silvertree Engineering has been a national and international leader in the field of wireless temperature monitoring and data-logging, making a major contribution to public safety in healthcare, food, pharmaceutical, bio-tech and other sectors. With support from an experienced Business Link adviser, the company confronted the recession by developing a clear strategy for the future. 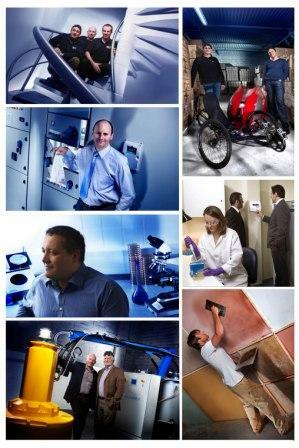 Similar support enabled Scientific Services Ltd, a nationally-respected laboratory and scientific consulting business based near St Austell, to complete a major design project to help it bring new services to market and win more business by being at the cutting edge in customer service. Another ground-breaking Cornish engineering company with some 60 staff also has an outstanding engineering pedigree. The support it has received has now helped St Columb-based A&T Services to open up new markets where its true turnkey service for plant and machinery – from solution design, to manufacture, installation and training – are in growing demand. Orchid Plastics in Callington has been able to develop an excellent reputation for the design and manufacture of high quality plastic rotational mouldings, and has seen its turnover increase by 35% over the past year. With help from Business Link, it’s now building on this success and looks set to double its turnover in the next three years. Construction is one sector of industry that suffered more than most during the downturn. But, even here, the help provided by Business Link has helped progressive development for many Cornish firms. Building on outstanding technical skill, Helston-based Clayworks Ltd is helping to make true zero-carbon building a practical reality and so help resolve a critical challenge for the building industry. In the same town, Spiral Construction took the opportunity presented by a major expansion of its premises to harness support from Business Link to help it bring all its buildings and processes up to the highest international environmental standards. The legacy of the support provided by Business Link’s Convergence service in the county has provided firm foundations for all of these businesses and many, many more. It has also helped to instil the self-belief and enterprise vitality that will be the heartbeat of our future economic prosperity.